Klondike Solitaire: Play for Free! No Download! No Registration! Klondike Solitaire - Play online for free! Solitaire is a game of patience that, as the name suggests, is played alone! the "Tableau" consists of 28 cards made up of 7 piles that increase in size. Each pile has the corresponding number of cards: the 1st pile has 1 card, the 2nd has 2, the third has 3, etc... up to the pile with 7 cards. At the start of the game, only the top card is face up. the "Reserve" (otherwise known as Depot) consists of the remaining 24 cards of the game that are stacked face down. the "Foundations" consist of 4 FreeCells, usable from the beginning of the game. 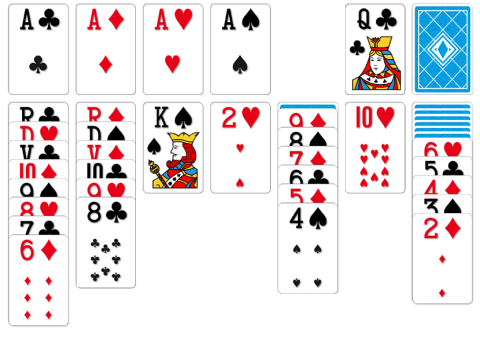 The goal of Klondike Solitaire is to fill the 4 Foundations by following ascending suit sequences (ace, two, three, four, five, six, seven, eight, nine, ten, jack, queen, and king) of the same suit (clubs, spades, diamonds, or hearts). in the Tableau's piles, follow descending suit sequences (king, queen, jack, 10, 9, 8, 7, 6, 5, 4, 3, 2, ace) with alternating colors (red or black: the card suit does not matter). you can only place kings on the Tableau's FreeCells. 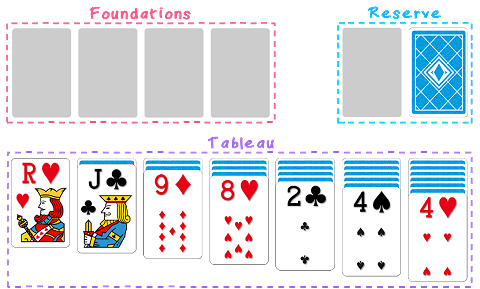 you can move descending sequences of any number of cards to another pile , or move an entire pile to a new cell. when useful, you can take a card from one of the 4 Foundations, and place it on the Tableau. draw a card from the Reserve if there are no more possibles moves. Sorry, it appears you are using an internet browser that is not currently supported.